Wednesday, March 15, 2017. 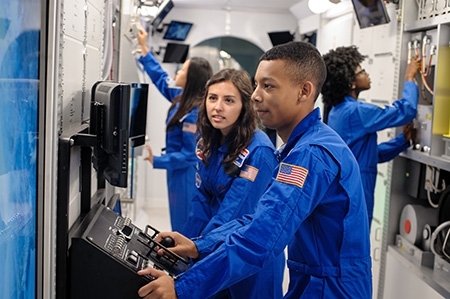 We’re very pleased to announce that our 7th-grader, Arabella, has received a scholarship for the US Space Camp in Huntsville, Alabama. She has her choice of any of the 5-day programs over the next year. The participants learn a lot of astronaut training, including weightlessness simulation in a water tank and mission simulations. Arabella has been with us for 6 years and is a top student. She was a key participant in our 3-year project to design, build, and test a periodic table of the chemical elements with computer-controlled lights and student-written-and-narrated stories (315 of them!) about the chemical elements. She also was one of two of our students, the other being Alegra, to represent the entire state of New Mexico in a Western regional competition in Chinese run by the Los Angeles Education Consul of the Chinese government. Arabella thanks our Head of School Lou Ellen Kay and board chair Vince Gutschick, both science doctorates, for writing key letters of recommendation that helped her get the scholarship. Arabella, you carried the weight!